Mumbai’s mega flood in 2005 , like a tsunami or other natural disaster, marked a turning point in the city’s management. Yet, public memory being proverbially short, it passed unnoticed by the media, not to mention the political class and bureaucracy. It fell upon the Mumbai Vikas Samiti (MVS), an NGO set up after the flood -- surprisingly, by retired top engineers from the Brihanmumbai Municipal Corporation (BMC) -- to organise a meet which took stock of the situation since then. The central lesson of the cataclysmic floods which occurred after the city received 944 mm of rain in 24 hours -- three-quarters of which fell in just five hours between 2.30 and 7.30 pm -- is the abysmal lack of drainage to cope with a downpour of this magnitude. When this coincides with high tides, as the July 25 torrents were, there is little escape for a city that is badly planned. Amazingly, the downpour only affected the suburbs, leaving the island city largely untouched. Indeed, the Chief Minister was closeted with his disaster relief aides in Mantralaya till 4pm that afternoon, tracking floods in the Konkan, from where many Maharashtra politicians hail. When land lines, cell phones and TV channels were on the blink, they were supremely unaware of what was happening right under their very noses till it was too late. 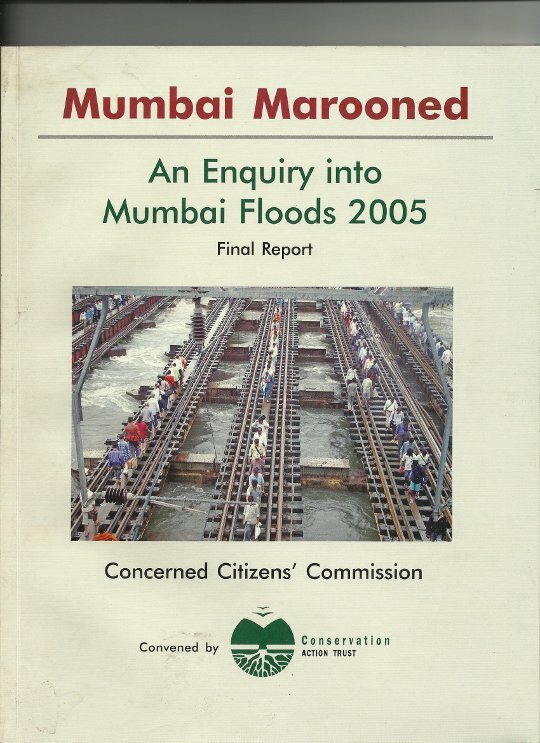 This writer served on the Concerned Citizens’ Commission, which painstakingly investigated the causes and consequences of the flood and produce a report the following year titled “Mumbai Marooned”. According to official figures, 546 people died in Mumbai that day and its immediate aftermath -- including 179 who drowned and 75 killed in landslides. There was also an unknown number of the poorest slum dwellers who lived in unauthorised dwellings and remained simply untraceable. Much of the Konkan coast below Mumbai was also hit, though not as badly, causing about as many deaths as well as 141 missing. As we learned when we visited several of the worst-affected slums in low-lying areas, there was virtually no time to save any belongings because it wasn’t a gradual process: the rising water swamped these precincts all of a sudden as it overflowed. Residents could flee only with their loved ones and the clothes they were wearing, not even their most precious possessions – a ration card or proof of residence, most valuable in the event of a demolition drive or redevelopment project. The flood also impacted middle class housing colonies belonging to Air-India and Central Railway employees in Kalina, near the domestic and international airports, which are perennially flooded during the monsoons. These residents abandoned their ground-floor apartments after 2005, while others showed us the level which the rising waters had reached well within their homes, on walls some 15 feet from the ground. It would be true to say that the drainage legacy that British engineers left what was then Bombay, mostly in the island city, has by and large coped well, but the suburbs aren’t as well serviced and couldn’t withstand nature’s fury that fateful day. As MVS noted on the anniversary, the storm water drains were designed to cope with rainfall of 25 mm or one inch an hour, with half of this absorbed or retained on land and the rest flowing to the sea. On stormy monsoon days, the intensity can reach 50 mm to 100 mm an hour; on July 26, it touched 136 mm. The system worked reasonably till 1960, when the newly-formed state – carved out of undivided Bombay, of which what is now Gujarat was part – came into being. Congress politicians in the late ‘sixties went on a reclamation and building spree, particularly in the southernmost tip of the city, and changed its face irreversibly. By the time the fledgling environmental movement largely forced a halt to this reclamation in 1974, it was too late. Egged on by the skyrocketing prices in the mushrooming high-rises in the central business district, builders turned their attention to the suburbs and started developing plots haphazardly, with little or no thought to how these concreted-over areas would cope in the event of heavy rains. Due to such floods, MVS reports, the BMC appointed the Natu committee in 1975. It suggested modern measures like gates, barrages, pumping stations and last but not least, desilting of drains and nullahs. Some of these were implemented in south Bombay later. When the city was lashed by heavy rains in June 1985, the BMC appointed British consultants Watson Hawksly with a local counterpart to prepare a master plan to cope with 50 mm an hour. In time-(dis)honoured fashion, the report was only submitted in 1993 and known as the Brihanmumbai Storm Water Drainage report or by its ungainly acronym BRIMSTOWAD. Despite its tongue-twister, the report is actually hailed as an excellent blueprint for Mumbai – and, for that matter, other coastal and inland cities. The consultants divided the drainage network into 121 catchments and identified deficiencies in the system. The cost for implementing the recommendations was Rs 616 crores, to be carried out over 12 years. The country’s richest corporation, ruled for 25 years by the venal Shiv Sena, spent only Rs 260 crores by 2007, while major recommendations weren’t carried out. These included pumping stations, the renovation of age-old drains, diversion of flows, widening of railway culverts , deepening and widening nullahs and so on. “The systematic cleaning of the underground drains and desilting of nullahs was also not carried out properly before the onset of the monsoon,” the MVS observes. Did we learn our lessons? July 2005 was a wake-up call to Mumbaikars because of what was considered a filthy drain – the Mithi river, which emptied toxic sludge and sewage into the Mahim Bay – overflowed and caused havoc in its wake. Till today, few residents are aware of the three other rivers –Poisar, Dahisar and Oshiwara -- which course through the city, not to mention that network of nullahs which are like their tributaries. Through abject neglect, these water courses have been dumped with filth and their banks encroached upon. In the case of the Mithi, it has been bent 90 degrees at the airport to extend the taxiway of the Sahar international airport by building a bridge over the river, which was under construction on July 25. The CCC blamed this as partly responsible for flooding adjoining and upstream areas, closing the airport. Due to the expansion of the airport over 181 hectares, four out of five drains in Kalina which used to hold excess rainfall were choked. One slum dweller, who used to live near the airport and lost his one-year-old son during the floods, described the Mithi stretch being reduced to a “gutter”. Tragically for a city which prides itself being “urbs prima in Indis” and the commercial capital of the country, the airport was flooded for a day, cancelling hundreds of flights and adding to the enormous financial losses caused by the deluge. The Maharashtra government spent as much as Rs 476 crores on relief, of which Rs 200 crores were on Mumbai and Rs 100 crores in the outlying township of Thane. The argument that the city can’t afford to insulate itself as much as possible from torrential rain, which will only increase with climate change, is wholly false. Apart from possessing the resources to do so, there is a huge financial cost – borne by the state as well as citizens – of coping with the loss of life and property. Belatedly, as Mahesh Narvekar, Chief Officer of the state government’s disaster management department informed the MVS meet, the state has put in place a full-fledged cell [http://dm.mcgm.gov.in/home] to deal with such emergencies. He cited the official Madhav Chitale committee, which the government appointed after 2005, as listing 32 types of disasters, to which Mumbai was prone to 28. A good 300 years ago, Mumbai was impacted by an earthquake measuring 9.0; the casualties were relatively low only because the city’s population was just 2 lakhs. According to an IIT-B engineer, if the same quake occurs today, we could be looking at 1,70,000 deaths. No one can predict natural disasters, but we can surely take precautionary measures. All cities besides Mumbai – notably coastal Chennai in December 2015 and Bengaluru – have faced indiscriminate filling up of ponds, reservoirs, rivers and nullahs in the mindless haste to construct buildings without proper guidelines. Chennai is built on the floodplains of the Adyar and Coovam rivers. Even the very newest city, the capital of Andhra Pradesh at Amaravati, has a master plan by Singapore architects who presumably have no experience of dealing with poor countries: the city is being built right on the floodplains of the mighty Krishna river. Consider that the first three older cities cited all have IIT or other top institutes of technical excellence, it is high time that experts advised the authorities about how to plan cities bearing in mind urban ecology in general and water courses in particular. These cities already have such institutions and NGOs in place and they must be given a greater voice in in urban management, considering the eco-illiteracy of the powers-that-be. Way Forward Chennai, for instance, is one initiative post-2015 that deserves to be emulated. If we employ the human body as a metaphor to describe a city, water courses are like veins which carry life-sustaining flows through the entire system and clear it of excess fluid. Block them indiscriminately and you face the danger of suffering sclerosis, the final consequence of which may be cardiac arrest and worse.